Brazo de Oro is ending his career. He's announced plans to retire on October 5th, and has requested no special notice of this event. Most of his CMLL matches are in Arena Coliseo DF, working a midlevel match or filling in for a tecnico who didn't show. He doesn't have the charisma of his brother Brazo de Plata, but has been a solid worker. Brazo de Oro has held many behind the scenes roles during his career. 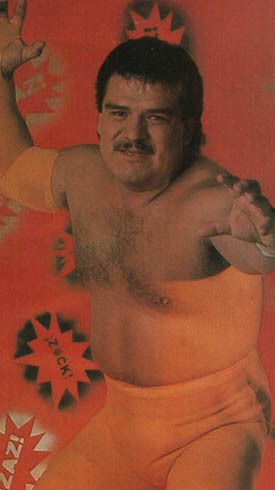 Brazo de Oro is the head of the wrestler's union, continuing on that role during his retirement. Brazo de Oro's acknowledged son, La Mascara, has received a strong push since his debut under that name, and it is speculated that Brazo de Oro's influence may contribute to his push, or at least explain the reasoning why Mascara's pushed and similar talented wrestlers are not. In 2006 it was confirmed that Brazo de Oro is indeed a member of the CMLL booking team and remains a member to this day. Previously, he was the booker for the Japan based UWF promotion. 78/01/29 mask (2) Brazo de Oro Águila Roja Plaza de Toros Monumental - Monterrey, N.L. 88/10/21 masks Villano I, Villano IV & Villano V El Brazo, Brazo de Oro & Brazo de Plata Plaza de Toros Monumental - Monterrey, N.L. 1990/11/07 hair Brazo de Oro Babe Face ? This page was last edited on 16 April 2019, at 18:44.